(Bloomberg) -- When Croatian defender Domagoj Vida shouted “Glory to Ukraine” in an online video message after his team defeated Russia in the quarterfinals of the soccer World Cup, it was a reminder that sport and politics can’t always be separated whatever Russian President Vladimir Putin might say. Vida, who played for Dynamo Kyiv for more than five years until January, insisted in an initial statement issued by the Croatian Football Federation that he and coaching assistant Ognjen Vukojevic, who was also in the video, were simply thanking their Ukrainian fans for their support. Vukojevic, who called the win over the host nation “a victory for Dynamo and Ukraine,” also played for Dynamo Kyiv for several years. 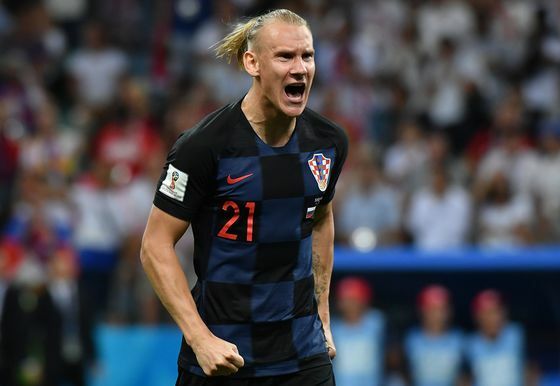 “I sincerely hope that this message will not be understood as anything else,” said Vida, who scored Croatia’s second goal in Saturday’s 2-2 draw with Russia and smashed home a penalty in the decisive shootout after the teams remained tied at the end of extra time. On Monday, however, the federation issued another statement announcing that it had revoked Vukojevic’s accreditation and removed him from the national squad for publishing the video. He and Vida “likewise apologize for their statements, which were in no way intended to have political connotations, yet which unfortunately left room for such interpretations,” according to the statement. The phrase “Glory to Ukraine” is commonly used by supporters of the 2014 revolution that overthrew the country’s pro-Russian president. With Ukraine and Russia locked in confrontation over the 2014 annexation of Crimea and the war against Kremlin-backed separatists in eastern Ukraine, it carries even more political overtones. Many in the Balkans also see parallels in the Russia-Ukraine conflict with the war that erupted between Serbs and Croats in the 1990s as the former Yugoslavia fell apart. As controversy swirled over the remark in Russian media, soccer’s governing body, FIFA, which has rules against political gestures, issued Vida with a warning, while opting not to ban him from Wednesday’s semifinal game against England in Moscow. It had earlier fined two Swiss players with roots in Kosovo who celebrated their goals that defeated Serbia in the tournament’s group stage by making double-headed eagle gestures with their hands, emulating the symbol on the Albanian flag. Serbia and Russia don’t recognize Kosovo’s independence. While Putin insists there’s no place for politics in sport, he told former soccer stars invited to the Kremlin last week that having the World Cup in Russia has “helped destroy many stereotypes” about the country at a time of international tensions. Russia has earned widespread praise for its efficient hosting of the world’s most-watched sports event, while foreign fans say they’ve been surprised by the warm welcome from Russians. Politics will be harder to avoid if England defeat Croatia to reach the final for the first time in 52 years. Prime Minister Theresa May ordered officials including Prince William, who’s president of the English Football Association, to boycott the World Cup over the nerve-agent poisoning of a former spy in England that the U.K. blames on the Kremlin. The death of a British citizen from the same poison on Sunday would make any thoughts of joining Putin at the final even more controversial.